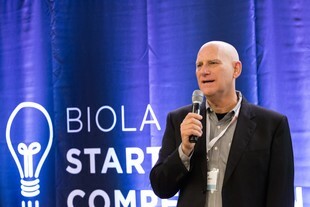 The 2nd Annual Biola Startup Competition will kickoff on Monday, Sept. 19 with a presentation by John Schad, vice president of marketing for 20th Century Fox. Schad has led marketing initiatives for films including Star Wars, X-Men, The Planet of the Apes, The Passion of the Christ and more. He has been involved with the startup of several companies, and served as an MBA student mentor at Biola University’s Crowell School of Business for the past 8 years. He will share wisdom he has learned throughout his career, professionally and personally, during his presentation. The competition is an initiative that offers Biola students and alumni the opportunity to transform an idea into a successful startup company. Teams can win up to thousands of dollars in awards to launch their business and are aided by experienced business leaders throughout the competition. Last year, 29 teams entered the competition. The winning team was White Elephant Post, a business aimed at providing students the opportunity to maximize their return on unwanted books and required academic materials, took first place. Team members received a $15,000 cash award along with a $10,000 legal services startup package from Brown & Streza, LLP and an accounting services startup package from Nienow & Company, LLP to get their idea up and running. Details including how to participate in this year’s competition will also be shared at the kickoff event on Sept. 19, which will be held at Biola’s Crowell School of Business at 7:30 p.m.
A new addition to this year’s competition advisory board is Jessica Rey, founder of Rey Swimwear. Inspired by fashion icon Audrey Hepburn, Rey Swimwear works to sew together contemporary fashion with vintage glamor. Established in May 2008, the company has experienced rapid growth in the last year. Rey joins nine other industry leaders on the board who offer expert coaching to the teams throughout the competition and assist in selecting the winning teams. There are three rounds to the competition with the final round concluding in a 15-page business plan developed by finalist teams who will be matched with a personal coach to assist in their plan. Finalists will pitch and present their business plan to a panel of judges on March 31, 2017, who will select the winners of the competition on the same day.